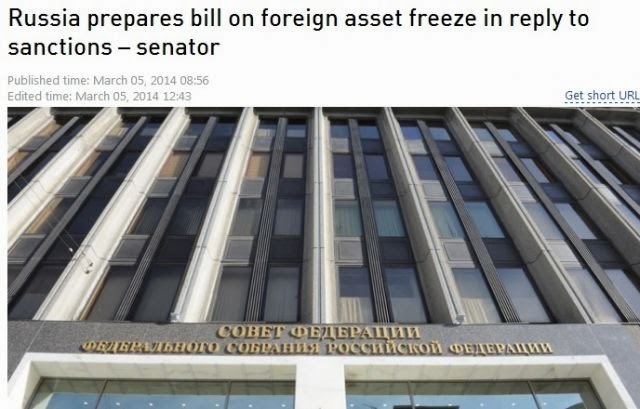 Russia To Propose Freezing US Assets And Confiscate Foreign Owned Property!!!! Home Editorials Russia To Propose Freezing US Assets And Confiscate Foreign Owned Property!!!! A Russian lawmaker is drafting a bill that would freeze the assets of European and American companies operating within Russia in the latest volley between the West and Russia as tensions continue to rise with rhetoric and outright threats. The chairman of the upper house committee for constitutional law, Andrey Klishas, is sure that Russia must have an enough leverage to deal with the threat of sanctions coming from foreign countries.A team of lawyers are currently preparing a separate federal bill that would allow the Russian president and government to confiscate foreign owned property in Russia, including assets belonging to private companies, the senator told the RIA Novosti news agency. The bill is in response to the major political crisis in Ukraine and the threat of sanctions against Russia coming from the USA and other countries. “All sanctions must be mutual,” Klishas stated. A move like this, if approved would spark what many have feared since the knowledge that the West spent $5 billion to destabilize the Ukraine and overthrow the elected pro-Moscow president, an all-out cold war that could even go hot with one wrong threat from either side. Whether people want to admit it or not, we are at war with Russia right now and we can only hope it doesn’t turn nuclear.